A double swing set, but with a twist, children will love the endless play opportunities that this unique swing set provides. Includes two flat swing seats and a rope ladder. Suitable for children aged between 3 -12 years. The Kestrel puts a unique twist on the classic swing set. 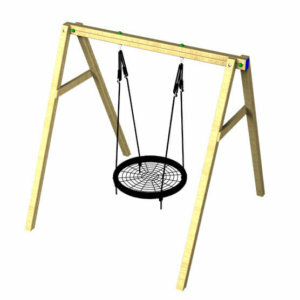 Featuring two flat seat swings and a challenging rope ladder, children will love playing together with this fantastic piece of play equipment. Suitable for children aged between 3 -12 years, children of different ages will be able to truly enjoy this one-stop play structure.